Large wheels for tackling all sorts of terrain with a smooth ride. The Bottom Line: The Solstice has a smooth ride and push that makes it fun to run with on dirt paths and sidewalks. It’s been great on the beach for low tide walks and standard beach fun. The features are well thought out and functional for both kid and parent. 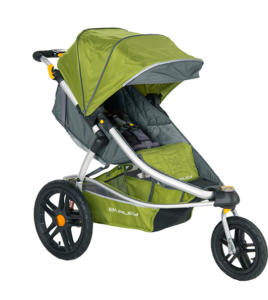 The large cargo basket on The Solstice make this such a useful workhorse of a stroller! Highly recommended. We use our strollers so much, they become like members of the family. When it was time for our last one, Bob the BOB, to retire, we replaced him with a Burley Solstice. It was a little intimidating at first—this stroller is not small or shy. One of the first things I noticed was its size . . . definitely bigger than BOB. It stretches out longer and the wheelbase in back is a smidge wider, but I have to say, seemingly against the law of physics, it folds down and manages to fit in my trunk better than Bob, without even popping off the wheels. Inside the house, we keep it folded down and in its self-standing position (yes it stands up on its own when folded)! The Solstice (aka Solly) quickly made herself at home with the family! So far I’ve taken Solly on the beach, sidewalks and groomed dirt paths with no drama. Really my favorite thing is that I can walk my son to school pushing my 15-month–old daughter, then go for a jog down to the beach and hit the grocery store on the way home loading her up. The large cargo basket on The Solstice make this such a useful workhorse of a stroller! Whether its beach gear, park gear or groceries packed to capacity and then some, the Solstice still maneuvers great. Solly is great for jogging—it’s smooth, and I sweat and feel exhausted and great, and my daughter gets to enjoy the experience as well—but it does so much more, and in my family, that wins big point. We’ve got a packed schedule and it’s great having a stroller that can keep up!